Recently we have branched out into entertainment reviews and we have another exciting DVD review with some of our members coming back to tell us what they thought of REBELLION series one, a five-part drama series that released on DVD through RLJ Entertainment October 5th. REBELLION is a birth story; a violent, terrifying and disruptive period in history that saw the birth of modern Ireland. This is a series based on events that took place in 1916 told through the eyes of a group of fictional characters. REBELLION begins with the outbreak of World War One, which is expected to be a short and glorious campaign. Those hopes are soon dashed and extremism comes to the fore as social stability erodes. Peoples reactions are extremely different. Some prioritise family loyalty while others takes sides. Some even take up arms, motivated by either noble ideals or opportunism and prepared to sacrifice everything for the dream of a better society. The events of the turbulent times are shown through the eyes of men, women and children from Belfast, Dublin, Galway and London. As is always the case there are winners and losers, loves and losses. Each episode runs for 60 minutes. Starring: Ian McElhinney (Game of Thrones) Niamh Cusack (Heartbeat), Brian Gleeson (Love/Hate), Charlie Murphy (Happy Valley), Sara Greene (Vikings), Ruth Bradley (Humans), Gus McDonagh (Love/Hate) and Michelle Fairley (Suits, Fortitude). 5 of our lucky members will receive a copy of the DVD for review, I look forward to reading what they thought in the comments section below. I personally could not get into this show, the pace at the start was very slow for me, it did pick up by the third episode. There are definitely some powerful and compelling scenes in this show, but found them few and far between. Not sure that it fully does justice to the events that transpired, but I have a feeling that a lot of people will really get into this period piece. Thanks for the opportunity to watch this series. 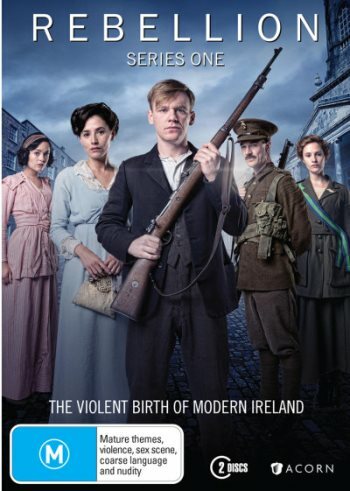 It gives an interesting take on how modern Ireland came to be in 1916. It was great to get different perspectives through the different characters as they fought through their own troubles. Overall, I enjoyed the series although at times it lacked a bit of momentum to keep you fully engaged. It is a good series for anyone interested in finding out the history of Ireland or anyone who likes historic drama. It is only a 5 part series so it’s small enough to enjoy over a couple of day. Thanks so much for the opportunity to review Rebellion. Unlike some of the previous reviewers I really enjoyed this series and found that I obtained a much greater understanding of the development of modern Ireland. I love historical dramas and found the characters in Rebellipn compelling and engaging (including a couple of familiar faces from other popular series). I watched with subtitles on to assist with accents. I was so very excited to be accepted to review Series one of Rebellion. I had hoped that it would arrive in time for me to take it with me when I went on a 7 week overseas holiday but sadly it arrived the same day that I left. Hence my late review. I arrived back on Wednesday and today being Saturday I sat down to watch the first episode out of the 5. The first episode was so good that I simply couldnt stop and Ive watched the entire Series 1 today and I will now be holding out to find Series 2. I have a strong interest in Ireland as that is where my ancestors are from. Rebellion is of course set in Ireland and is Based upon the 1916 Uprising. I knew the basics of that time but this series filled in the blanks for me and gave me a new understanding of the drama that occurred. I will be passing this on to a friend tomorrow as for me it was fantastic and im sure my friend will enjoy it also.